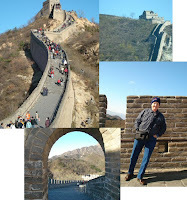 As we worked down our bucket list of places to see, China popped up on Bob's side of the list. It was definitely not on mine. To me, the mention of China conjured up images of crowded streets, people bumping into each other and off of each other like bumper cars, and lots of unrecognizable foodstuffs along with the anticipation of toilet facilities much less comfortable than what my Western cultured behind is used to. It did not disappoint. There was lots more we saw and ate and did and were inspired by. It'll be fun to revisit my journal. Actually, the trip was truly one of a lifetime and maybe, just maybe, I would rethink my reluctance to visit again.